Hello, lovelies! I started my Monday by going to the Registry of Deeds as early as 8:45 a.m. I have a transaction that I'll be closing in the next few weeks and I thank God always for the blessings. And since our car is colour-coded today every Monday, we just always stay at home as much as possible and do not make appointments except if it is something urgent. So, for today's style post is featuring ROSEGAL and I enjoyed this shoot because the outfit truly reflects my mood. I can't help but smile on the entire shoot. Well, it's just a short shoot, anyway. I just love this outfit! 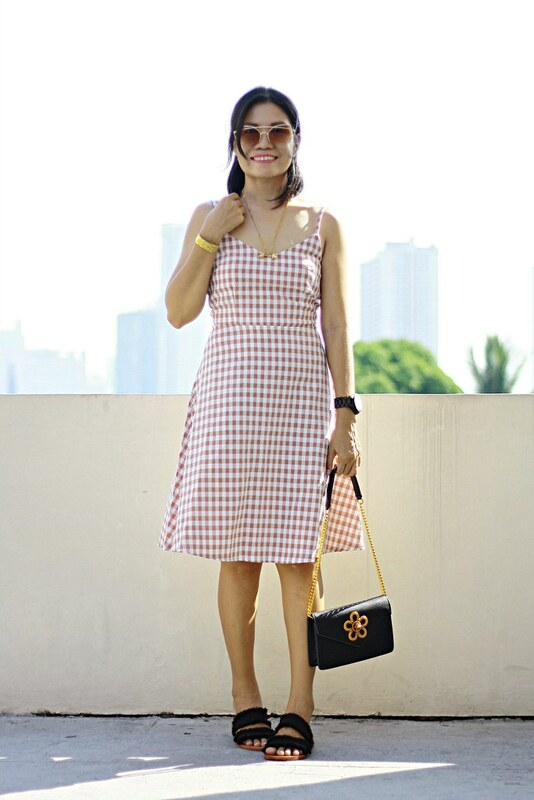 I ordered this khaki plaid sleeveless A-line slip dress because of its simple design. The A-line cut is another reason I got sold on this dress. I love A-line cuts because it accentuates and gives an illusion of a smaller waistline. And yes, it's for you to see to believe as it shows in this post. I have a lean column body type yet this dress makes my body looking oh-la-la. The fabric has no stretch and it fits perfectly on my waistline. It has a zipper and a tie closure at the back. The length is perfect; it sits on my knee level and I love it! I know I look familiar to a table cloth but this just gives me laidback feels. Haha! Overall, it's a worthy purchase. You can check out more a line dress in the website. 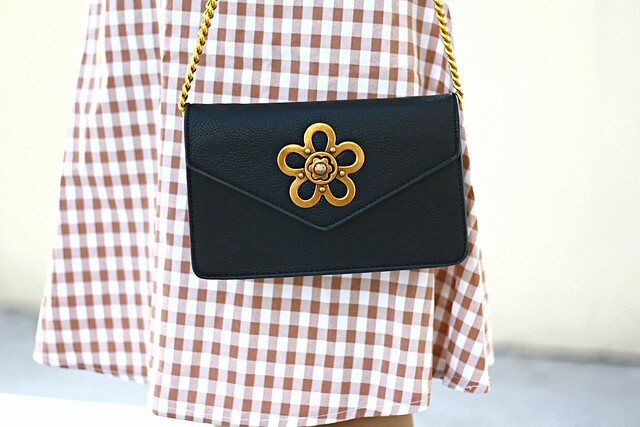 This flower turn lock chain crossbody bag is so beautiful in person. It was made in a high quality. My photos won't lie, I guarantee you that. It looks expensive yet I got it affordable. I find the flower turn lock very cute but not really practical when you're in a hurry because the lock must carefully push deeper for it to lock. Unlike other bag closures, this one needs extra care in opening and closing its lock. Anyway, I think it's an advantage for this bag's lock to last longer. Right? The texture is very nice and it was sewn neatly. I love that the strap is not all chained but with a PU leather handle, too. So the straps stay put on my shoulder. I will definitely be ordering all the colors available in pink, beige and red. This flat heel black denim slipper is a winner when we talk about comfort with style. You probably know now that I'm a sucker for anything denim. That's why when I saw this slipper is in denim, I didn't hesitate and added it to my shopping cart. This one looks so versatile. I can wear it casual yet looks stylish. I will definitely be ordering the other color in white. 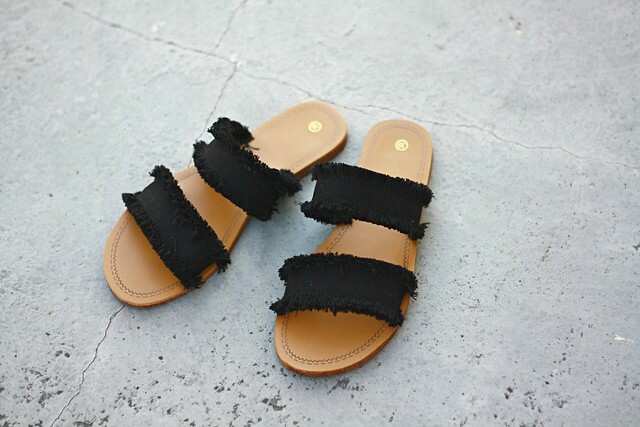 Check out more fashion slippers in the website.